Wesabe has been my favorite online money management tool for a long time. if you haven’t heard, you can read my review of Wesabe and in fact check out others reviews tagged with the same name. If you are a Wesabe user with an Internet enabled mobile or someone looking for an online money management application that has mobile support, you are in luck. Wesabe Mobile was just released this week. If you are a Blackberry user, consider using Opera Mini. The biggest hardship with tracking your expenses are the cash transactions that trickle out of your wallet. You have no clue what you did with the $40 cash withdrawal from the ATM after a week. 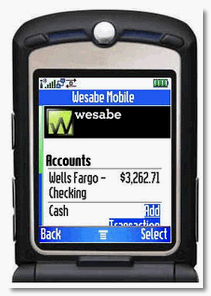 Wesabe Mobile cuts that gap for those with a data enabled cell phone. I don’t travel as much or have a data plan on my Sony Ericsson W810i. But, I am sure this will be useful to my iPhone/Blackberry wielding readers. very informative and nice post .